X-Large - $49.99 Only 7 left! Ah, Daddy Pig. He’s the everyman in Peppa Pig. He’s stuck in an office job and he eats more cake and cookies than one man should and pays the price for it. (Sorry, Mr. Pig, we know you like to tell people that your tummy is all muscle, but we’re not buying it.) He gets a little grumpy when he can’t find his glasses and he hates working out. He sounds pretty relatable. We’d hang out with him after work if he asked us, since he seems like our kind of pig. So, are you a little like Daddy Pig, the everypig? Then, maybe it’s time you turned yourself into the funny character from Peppa Pig! 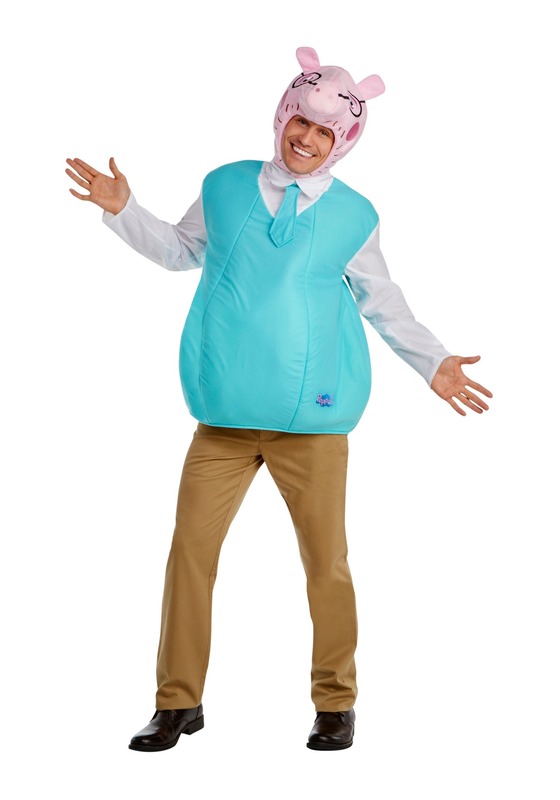 Based on the adorable cartoon series, this adult Daddy Pig costume comes with a turquoise top, complete with a matching tie attached to the top. The tummy even looks a little pudgy, much like the real Daddy Pig’s “muscles”. You also get the Daddy Pig headpiece, which has all of Daddy Pig’s features, like some fake beard hairs and glasses attached to the face. You’ll be ready to become head of the house while wearing it. This officially licensed costume also makes for a great family costume idea, since we also carry Mummy Pig and Peppa Pig costumes to perfectly complement this outfit. You may, however, feel a strong urge to eat a little too many cookies when you wear this (to gain some extra muscles, of course). Looks just like Daddy Pig. The tummy is too funny. I would go up a size if you are in between sizes. Doesn't have a tail like the rest of the family which I found strange.